As in other Episcopal churches, the Sunday liturgy at SsAM uses The Book of Common Prayer as a framework, but where we are different is in our ability to draw from many diverse resources such as Enriching our Worship. 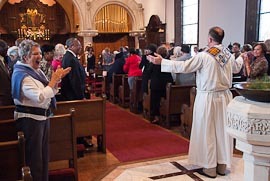 Regardless of the source, our liturgy follows the form of gathering in the Lord’s name, proclaiming and responding to God’s word, praying for the church and the world, exchanging the peace, making Eucharist (giving thanks), sharing the gifts of God and going out into the world empowered by God’s love. Within the parameters of the prayer book, we have found a way to create liturgy that is unique, such as the seven weeks of the Season of Creation during the latter part of Pentecost. In this spiritual journey into all aspects of creation, human, the natural environment and other living creatures, we celebrate the wonders of God’s creation and commit ourselves to being peacemaking stewards in ourselves, our local communities and the world by using readings from writers other than those from the Bible. 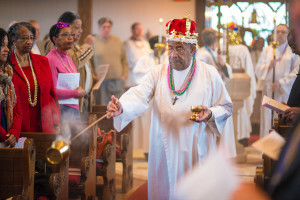 Carnival Sunday, the Sunday before Lent, provides another special liturgy at SsAM when, at the 10:30 a.m. service, we celebrate with masks, beads and colorful garb before the somber days of Lent begin. In our celebrations of faith in and love for God, you may notice that people use a variety of gestures and postures during the liturgy, such as making the sign of the cross, bowing to the processional cross as it passes, bowing to the altar, standing or kneeling for prayer. These gestures help many of us in our worship, but no one is required to do them. You are encouraged to do what enhances your worship experience. 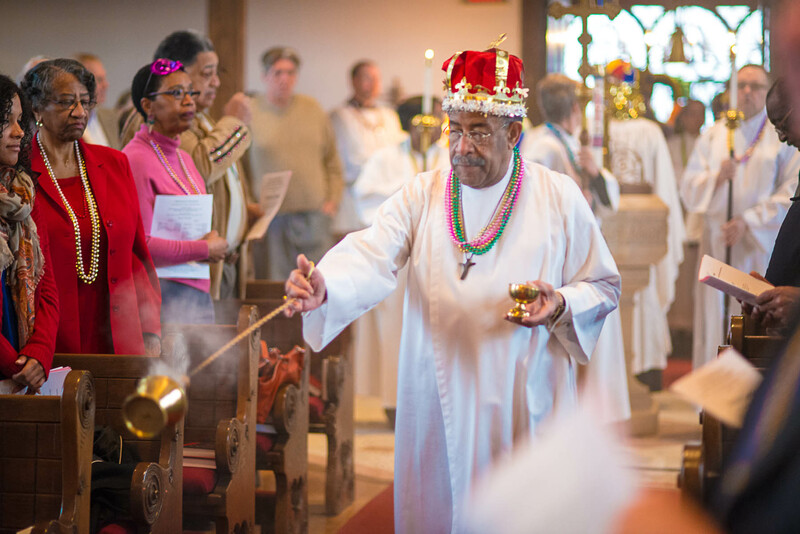 In the Episcopal Church, the color of vestments and church hangings change during the various liturgical seasons of the year, starting with Advent, and continuing with Christmas, Epiphany, Lent, Easter, and for most of the year, Pentecost. At our 10:30 a.m. service, we use music of all kinds to express the feeling of each season. Our talented organist, choir director, and choir combine to bring together a blend of traditional hymns, spirituals, jazz, Anglican Chant, Taize, as well as Native American and other ethnic music. Read our statement on music and liturgical design. More about our liturgy can be found in Our liturgy unfolded 2016.